It’s likely that you align your values with many decisions. You care about the health and well-being of your family and planet, so perhaps you buy organic, drive a Prius, avoid bottled water, recycle, and shop locally. That’s a great start, but where do you bank, and what do your investments support? 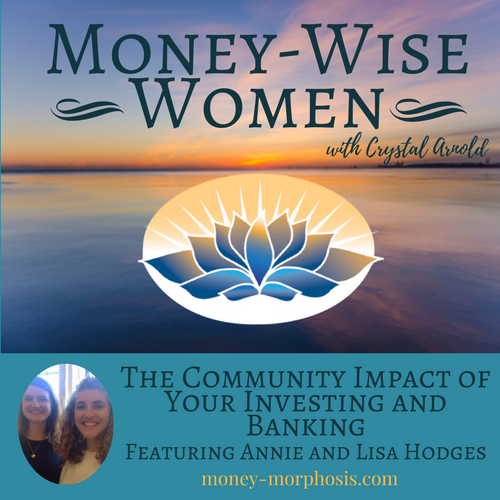 You will be inspired by the innovative approaches described by today’s “Money-Wise Women” show guests, sisters Annie and Lisa Hodges. Together, they work to educate others, especially Millennials, about opportunities to affect change through their financial choices. They are creating conversations about how impact investing and community-development banking can empower people to align their money with their values. You don’t need to be financially wealthy to invest your money and create impact! As Lisa says, “If you have a bank account you are an investor.” Many people don’t understand how our current fractional-reserve-banking system works. Your bank can loan $9 out to other people based on every $10 of cash savings in your account. Many big banks and traditional stock funds invest heavily in things that you may not want to support. Oil pipelines, private prisons, big box stores, defense contractors, and GMO seed suppliers are hidden beneficiaries of your financial choices. The urge to align values with money is becoming more intense. People wield underestimated power with their finances. 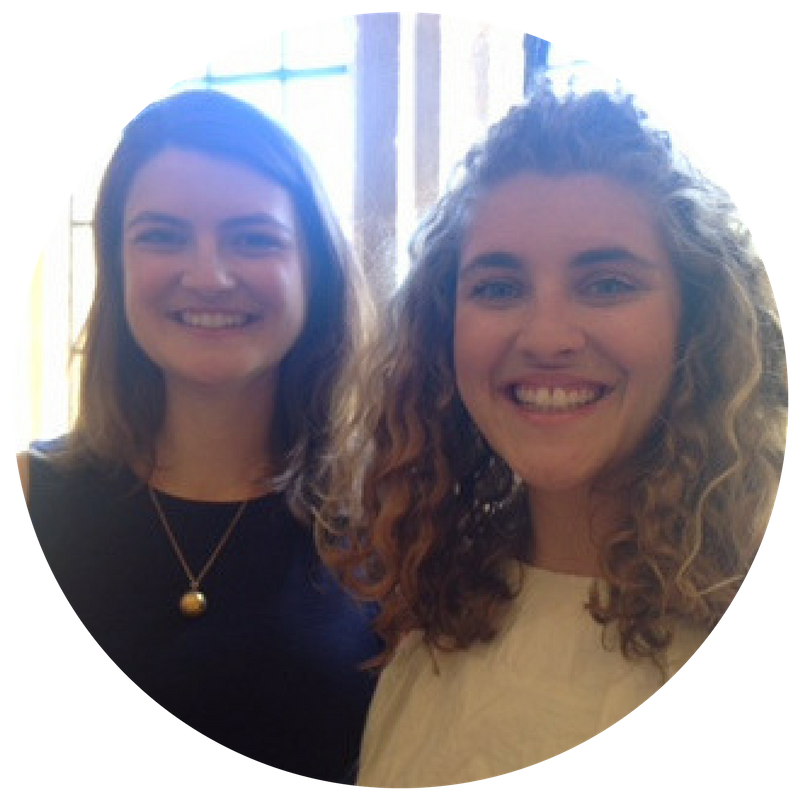 This is why these sisters are working to demystify impact investing. People with as little as $20 can invest in community investment notes from the Calvert Foundation. With a minimum of $1,000 to invest you also have access to low-risk impact options through RSF Finance. As people exercise their values, anxiety and doubt melt away and choices become more clear. Lisa says, “It’s easy to fall into the trap of using money as the only barometer of success. We are un-spelling powerful stories—it’s a process.” Indeed, it is important to assess the value of often unmeasured things, like relationships, environmental impact, and our health, when making a financial decision. Money is not the only measure of value! What does banking and investment look like in a more intimate economy? Essentially, the economy is how people care for one another. Relationships are at the foundation of each transaction. Transparency creates integrity in the system. What creates value in a more intimate economy is how something feels, which is why it is vitally important that people adjust how they feel about money. The shame and fear of talking about money prevent many from engaging with their finances in a satisfying and meaningful way. Annie talks about attending a conference for the very wealthy. The mindset of scarcity and fear of losing their money was palpable. Community-development banks are an alternative to private banks that the Hodges recommend. Through local lending, these banks provide relationship-based finance to under-served populations. The sisters describe the transformative decisions they made to leverage their money and find value through impact investing. They have become a powerful force for change in their own family and community. How? By talking about money openly! Through more intimate conversations about values and finances, people are shifting their beliefs about scarcity. In their “living room finance” meeting series, Annie and Lisa are creating a space not only to share one’s personal money story but also to take purpose-driven action. Through these authentic conversations, people can alleviate their fears of survival and feelings of not-enough. Have the courage to connect with others and dispel those beliefs that keep you from creating an impact. “I’m too old or young to be valuable. I don’t have enough money. I’m just one person, I can’t make a difference.” As individuals develop greater emotional intelligence, they engage in more meaningful and satisfying ways with the outside world. Authentic connections between individuals are the threads that weave a more intimate economy. Annie Hodges is engaged with places and stories, new and old, that serve human connection and healing. She’s based in Washington, D.C., and builds community using systems of shared values. She is working on creative solutions for economic sustainability. Lisa Hodges is the founder of The Shift Project, which aims to help young adults to match their money with their values. She supports people to reclaim their personal power as investors—no matter how much they have. She’s passionate about bringing impact investing to a broad audience to fuel a better world.